Ralph Waldo Emerson (Boston 1803-1882) was a poet and essayist associated strongly with Romanticism and one of the founders of Transcendentalism. These movements were reactions to the industrialization of the society at the turn of the 19th century, and reactions especially against the world's increasing complexity. 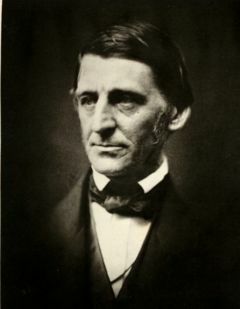 Emerson, along with other trancendentalist poets, believed that a respect for or a return to the simplicity of the beauty of nature was required to preserve human uniqueness. Emerson graduated from Harvard University at the age of 18, and is well-known today for his many quips and insightful quotes. His addresses—including "The Philosophy of History," "Human Culture," "Human Life," and "The Present Age"—were based on material in his Journals (published posthumously, 1909-1914), a collection of observations and notes that he had begun while a student at Harvard. His most detailed statement of belief was reserved for his first published book, Nature (1836), which appeared anonymously but was soon correctly attributed to him... The volume received little notice, but it has come to be regarded as Emerson's most original and significant work, offering the essence of his philosophy of transcendentalism. "A foolish consistency is the hobgoblin of little minds, adored by petty statesmen." These were both in his famous essay, "Self Reliance." This page was last modified on 17 March 2019, at 10:43. This page has been accessed 13,570 times.